From the navigation menu, click to view the directory. It lists contacts imported from your company contacts and Salesforce. You can browse through the list or search for a contact name from the list and place calls. During a call with an unknown contact, you have the option to add a new contact. In the search box, enter the name of the contact you are looking for. It lists all the matching results. View options to chat, or call, if it is a contact from your 8x8 contact directory. 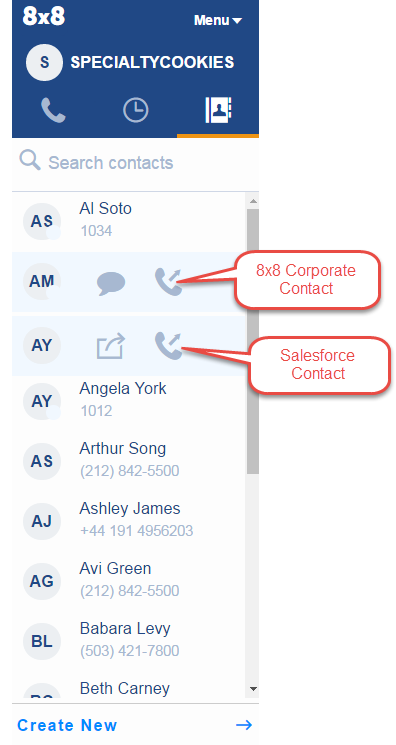 View options to open the contact record, or place a call, for a Salesforce contact. Note: You can select to load contacts from Salesforce and or 8x8 contact directory in Settings.